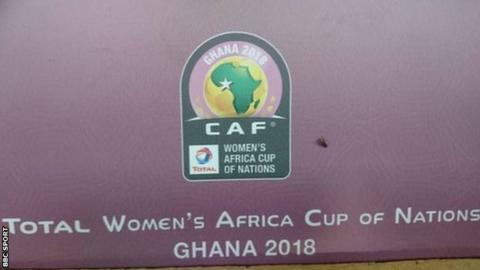 Cameroon beat Mali 4-2 in the 2018 Women's Africa Cup of Nations third place play-off match in Cape Coast to seal the remaining African spot at next year's Women's World Cup in France. Cameroon, Nations Cup runners-up in 2016, will join this year's finalists Nigeria and South Africa in France for the 2019 global showpiece event. Nigeria will attempt to win their ninth African title from 11 editions when they face Banyana Banyana in Saturday's final in the Ghanaian capital, Accra. Cameroon started well against Mali, stringing some nice moves together as they tried to exploit the pace of Nchout Ajara. After some nice play but poor crucial final passes, Cameroon made the breakthrough in the 32nd minute when Abena Ninon found the ball at her feet in the area and managed a turn to fire the ball home. Ninon made it 2-0 eight minutes later when she steered home a volley off a cross from Meffoumetou Falone. Just before the break Mali pulled one back as Bassira Toure's cross evaded the Cameroon defence allowing Fatoumata Diarra to control the ball and shoot low into the corner of the goal. After the break, Mali were level from an own-goal just before the hour mark. Cameroon defender Aurelle Awona tried to stop a cross from Sebe Coulibaly reaching Bassira Toure, but only succeeded in putting it into her own net. Cameroon retook the lead minutes later when Aboudi Onguene, on as a substitute, fired a fierce shot into the top left corner across the keeper as the ball rebounded to her from a failed clearance. Mali had a chance to draw level once again in the 74th minute as Yakare Niakate's great pass found Toure unmarked on the penalty spot with only the keeper to beat, but she fired over the bar to the groans of the crowd in the Cape Coast Stadium. Cameroon's win was sealed in injury time with a stunning long range free-kick from captain Christine Manie whose shot from 30 yards out floated into the top left corner over the keeper.